Harold Godwinson was the last crowned Anglo-Saxon king of England. He reigned from 6 January 1066 until his death at the Battle of Hastings, fighting the Norman invaders led by William the Conqueror during the Norman conquest of England. His death marked the end of Anglo-Saxon rule over England. Harold was a powerful earl and member of a prominent Anglo-Saxon family with ties to Cnut the Great. Upon the death of his brother-in-law King Edward the Confessor on 5 January 1066, the Witenagemot convened and chose Harold to succeed; he was crowned in Westminster Abbey. 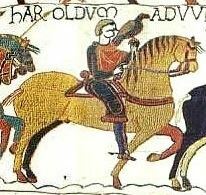 In late September, he successfully repelled an invasion by rival claimant Harald Hardrada of Norway before marching his army back south to meet William the Conqueror at Hastings two weeks later. The two armies clashed at the Battle of Hastings, at Senlac Hill close by Hastings on 14 October, where after nine hours of hard fighting, Harold was killed and his forces defeated.